Do you have trouble remembering what your medications are for or how to take them properly? We offer one-on-one consultations with our Pharmacists to review all of your medications in order to help you better understand them and get the most benefit from them. This service is paid for by the government and is available on an annual basis. Please speak to one of our pharmacy team members today to book your Meds Check consultation. Our Pharmacists are Certified Diabetes Educators. They are specialized and certified to teach people with diabetes and their families how to manage their condition in order to help them gain control of their disease. If you or a family member has diabetes and you would like to learn more please make an appointment with one of our CDE’s today! Did you know that 9 out of 10 Canadians will develop high blood pressure in their lifetime? High blood pressure also called hypertension can cause strokes, heart attacks, heart or kidney failure. High blood pressure often has no signs or symptoms which is why it is often called the “silent killer”. Detecting it early is very important to get the treatment necessary to reduce your risks. We provide FREE blood pressure monitoring so come in today to check yours! We can provide you with a wallet card to record your results so you can keep track of your readings. We also sell a variety of Home Blood Pressure Monitors. We know it’s not always easy to remember what medications you are taking and this can be even more difficult if you become ill and need medical attention. Our medication wallet cards provide an up-to-date list of your medications in a convenient wallet sized card that you should carry with you at all times. This allows you to share information with your caregivers or other healthcare professionals to ensure accurate and safe medication use. Take it with you to your next doctor’s appointment to ensure all of your medications are accounted for when you get your medications renewed. Ask for your medication wallet card today and be sure to get it updated if your medications change. Keeping track of multiple medications can be overwhelming and time consuming. Leave the work to us by getting your medications weekly in an easy to use compliance pack. For a small monthly fee, this service allows you to take your medications properly and get the most benefit from them. Weekly delivery of your compliance pack is available free of charge. Going on vacation? We can make up compliance packs for you to take on your trip to keep things simple. Please speak to one of our pharmacy team members today if you are interested. Being diagnosed with a health condition can leave you and your family feeling overwhelmed and scared. It is very important to learn as much as possible in order to manage your condition properly. Our pharmacies have a variety of resources available to provide education on various health conditions. Feel free to ask us how you can become more informed today! Are you interested in Biodentical Hormone Replacement Therapy? Do you have sensitivity to a colouring agent or filler in commercially prepared medication? Does your pet require a strength of medication that is not readily available? Our specialty compounding service allows us to tailor-make pharmaceutical products just for you including; flavourings, commercially unavailable strengths, discontinued medications or alternate routes of administration. Please speak to one of our pharmacists today! 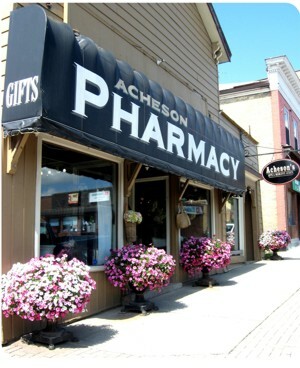 We invite you to visit our full service pharmacy and wide selection of quality gifts and home accents in store. NEW!! Visit all three of our locations (Acheson Pharmasave in Harriston, Lucknow Pharmasave and Pellow Pharmasave in Walkerton) and spend a minimum of $50.00 on regular priced gift, home décor and fashion accessories and receive a stamp. Once you have all three locations stamped, you will be rewarded with $50.00 to be used towards any regular priced gift, home décor as well as fashion accessories at any one of our three Pharmasave locations.